Windows 7 theme Wave is created by seahorsepip. Using Wave by seahorsepip makes your Windows 7 feel all lightweight and “fluffy”. What can I say about Wave, it’s minimal sleek and clean and on top of it blue (who doesn’t love blue) and it’s really something that other customizers should look up to, as an inspiration when designing VS. It has originality with all of those icons and wallpapers and also clean installer. It looks really nice on both on big lcd/led monitor and also small laptop and notebook lcd/led monitor. I hope it gets updated every now and then so it’s always popular and works even better on Windows 7. Wave is really something that everybody will like when trying it out. This Article Has Been Shared 413 Times! Just a heads up, the link to download the zip file has an extra ‘h’ in the ‘http’ section, so clicking it doesn’t work. The zip is still available at that location, though. I’m hoping it still works after two years! Thanks for the great input ! Yes, and it’s very beautiful! Just finished installing and configuring. I love minimal looking themes. Thank you for the post! Great, actually Your comment was really helpful. 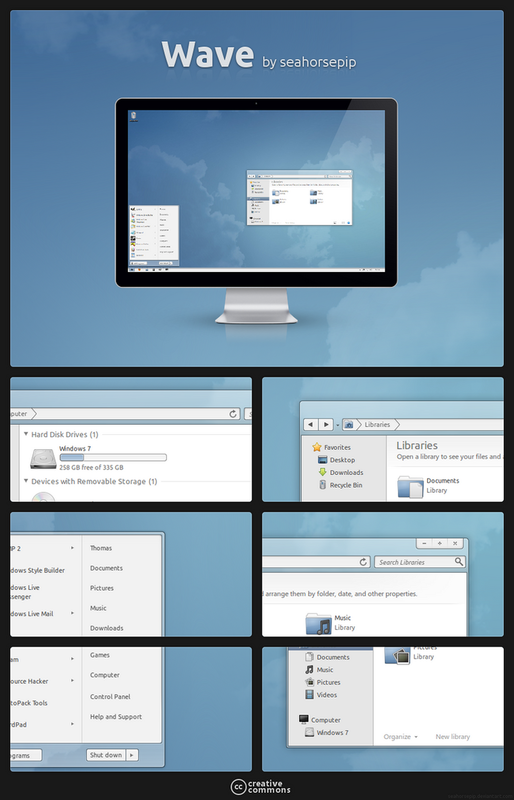 Cite this article as: Abhishek Ghosh, "Windows 7 Theme Wave : minimal sleek bluish theme," in The Customize Windows, May 21, 2011, April 26, 2019, https://thecustomizewindows.com/2011/05/windows-7-theme-wave-minimal-sleek-bluish-theme/.